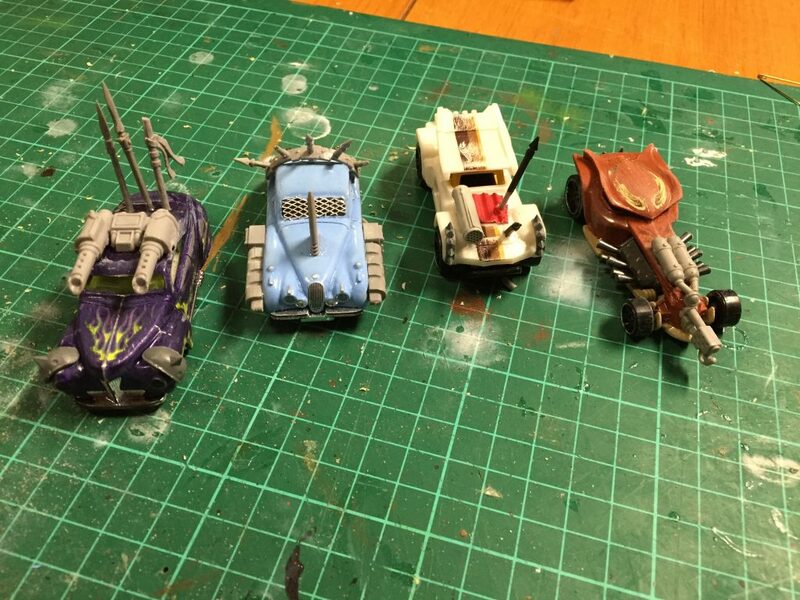 Building my Mad Max-inspired miniature vehicles was surprisingly straightforward. 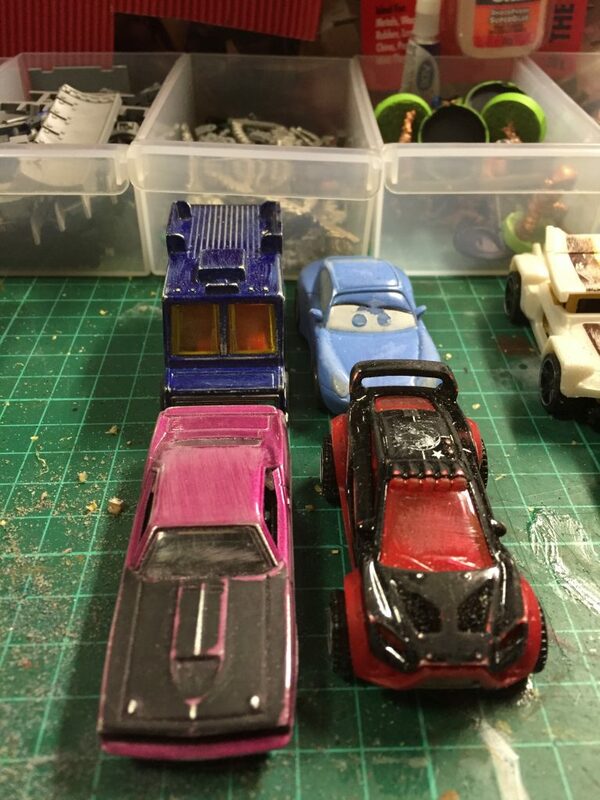 I started by gathering my hot wheels and matchbox cars and giving them a good going over with sand paper in order to ensure the paint would adhere. 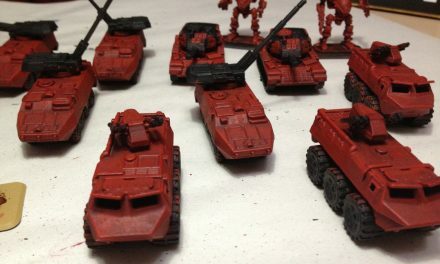 I probably didn’t need to do this with most of them, and I have seen some good conversions where the original paint schemes were kept, with just some weathering. However, I had a broad range of model qualities so wanted to pain them all in order to achieve a consistent look. Road Warriors: some cool, sporty vehicles (and an ice cream truck!) would become my classic Mad Max type guys. Notice the sporty blue Porsche at the back? Yes, that is a toy from the film “Cars”! 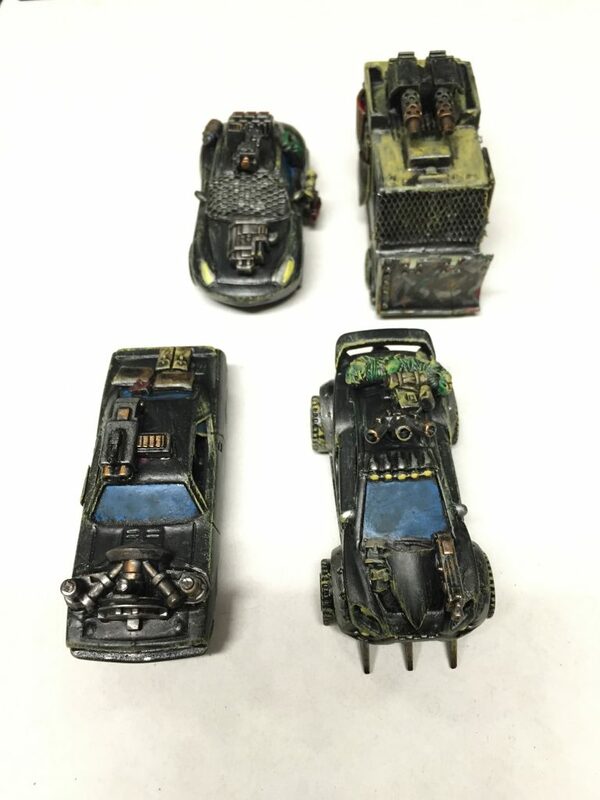 Hot Rods: I love the retro look of many of the vehicles in Fury Road and wanted to capture that in one of the convoys. I only had one suitable vehicle (okay, I had more, but my son wouldn’t let me take them! ), so actually bought three of these. Survivalists: buggies, humvees and jeeps are the perfect vehicles for nomads and other wasteland survivalists. I imagined piles of equipment for long-term travellers. Wreckers: these are big, chunky vehicles – trucks and pick-ups and the like. 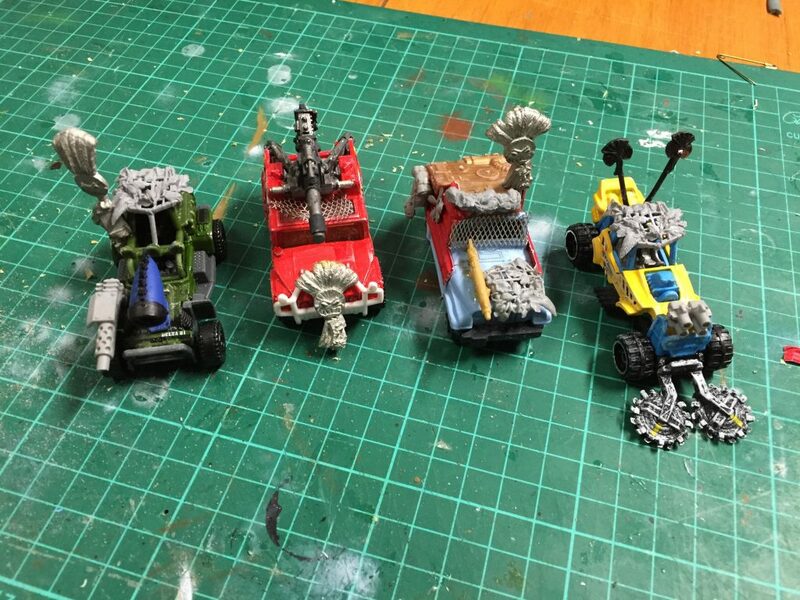 I wanted to build a convoy that specialised in hunting other cars, dragging them back to their base for spare parts. You can see in the background of each picture my containers of bits. I’m a hoarder so have all kinds of stuff from old vehicle kits, weapons and the like. 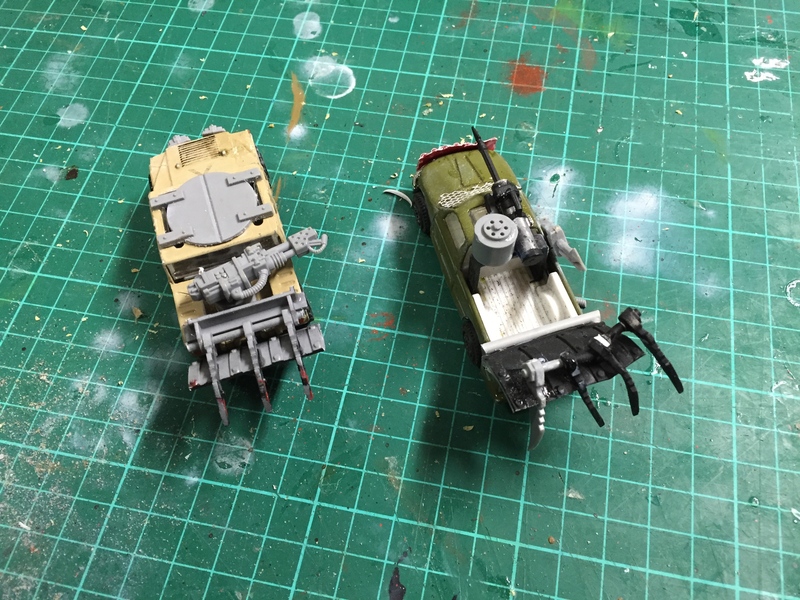 After I sorted through the vehicles I simply began to stick bits all over them. I made an effort not to over-think things. I could spend hours trying to find the perfect weapon or other bit for each vehicle, but that way lies madness! 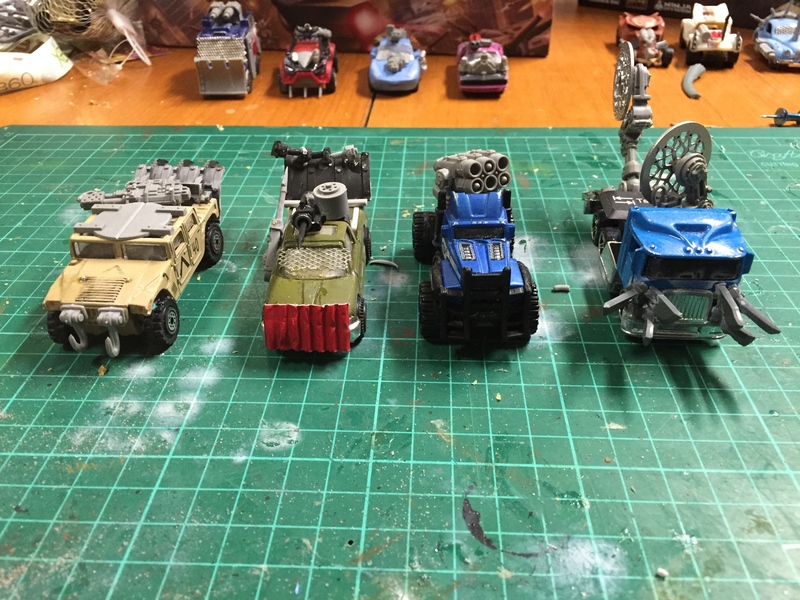 I did decide to stick to a theme for the additions for each group of vehicles. 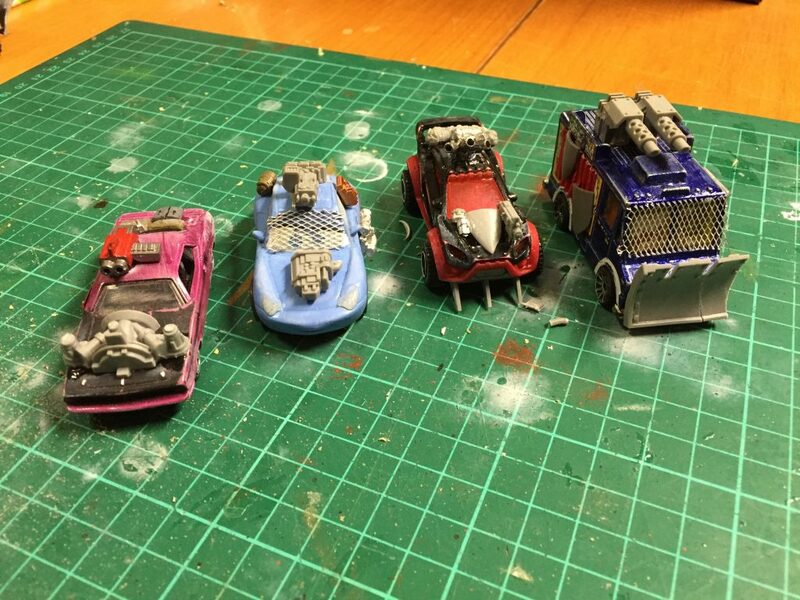 The road warriors were going to get big engines; the hot rodders were going to have spikes and stuff that looked like old machine guns; the survivalists would have a tribal feel; and the wreckers would have some “special” additions. 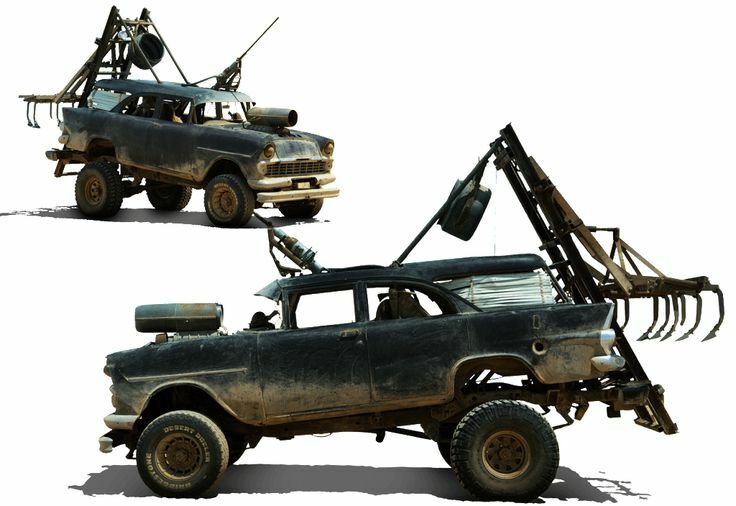 The road warriors got a small number of weapons and a few bits of equipment, inspired by the original Mad Max interceptor. 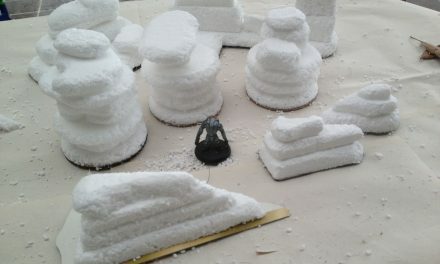 They were painted classic black with silver features. I gave the ice cream truck a bull dozer blade, too. 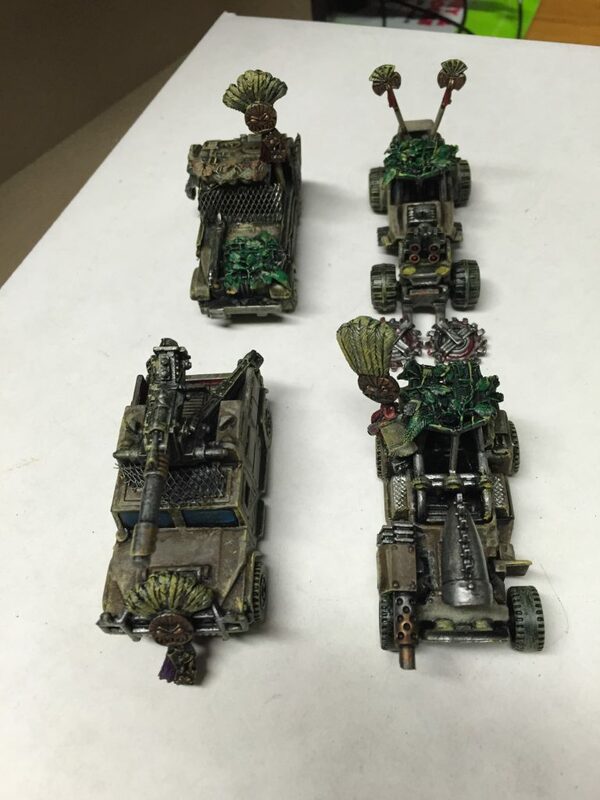 The hot rods got all forward-facing weapons and spikey bits, inspired by the beetles in Mad Max: Fury Road. 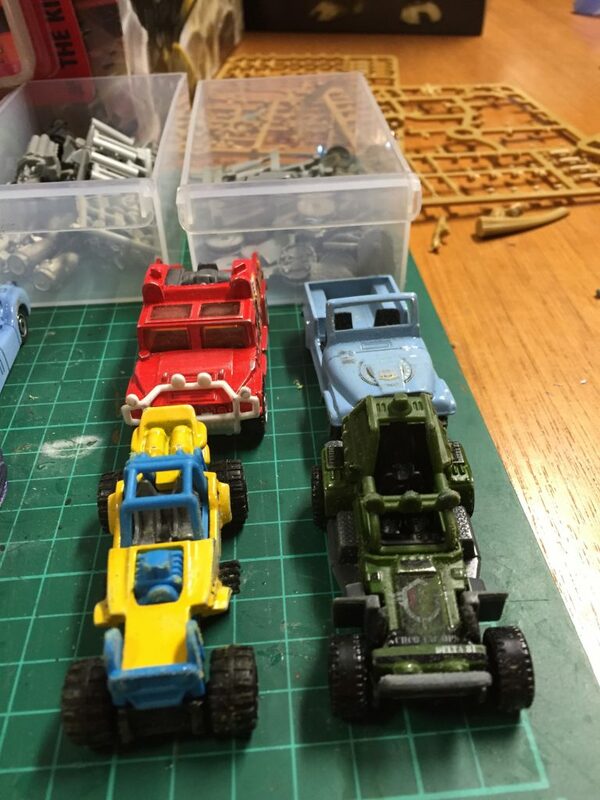 Some bold colours made this group of vehicles look distinct from the others. 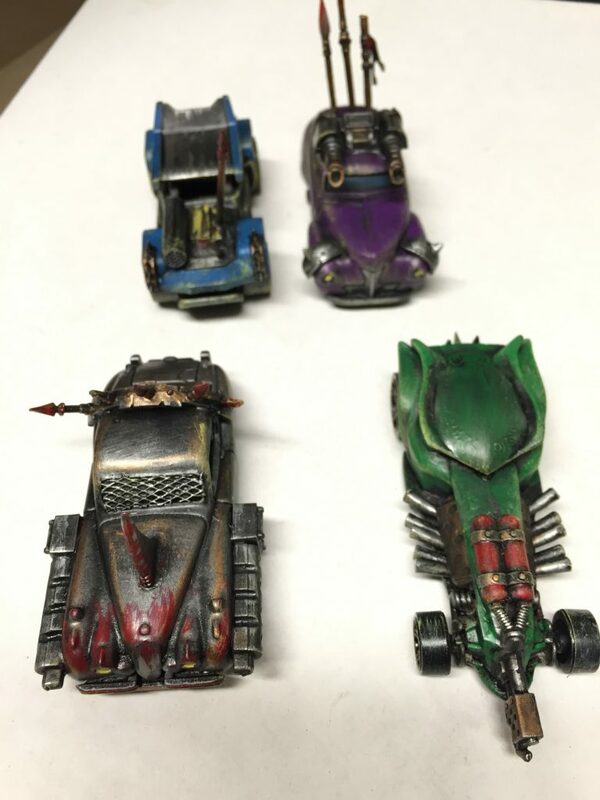 Although the green flame-thrower equipped car is cool, my favourite is the silver model next to it. 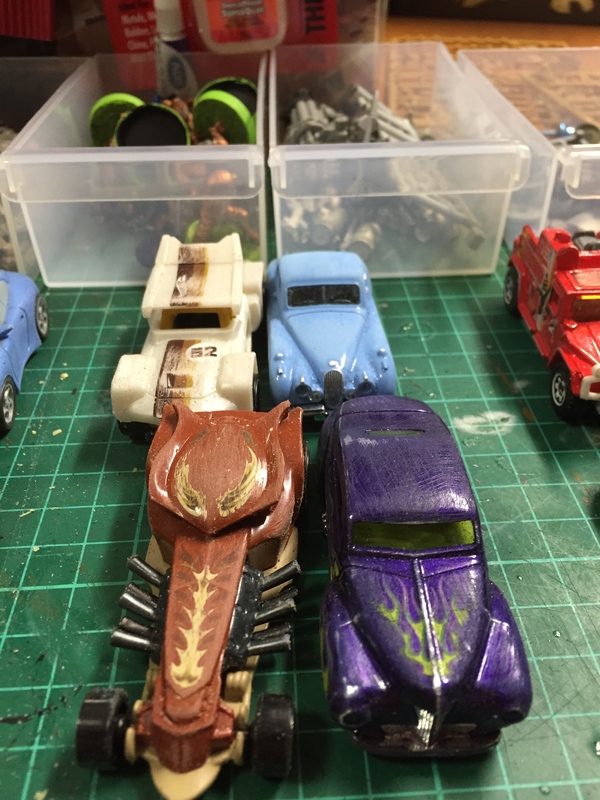 The inspiration for this convoy of vehicles. The survivalists got leafy camo blankets (they might be real plants from “the green place”, or they might not…), baggage, big guns and some banners that I thought gave them a bit of a savage, tribal feel. 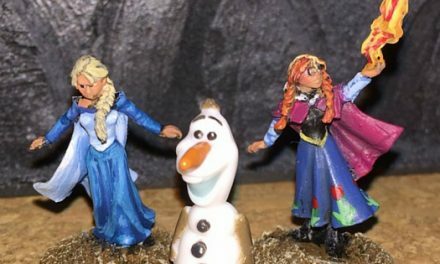 These “totem poles” are from Warhammer Lizardmen figures. There are some parts of this paint scheme I quite like, but I need to spend more time fixing up the feathers and other small details. I really like the humvee with the giant gun on top of it! I had some fun with the wreckers. 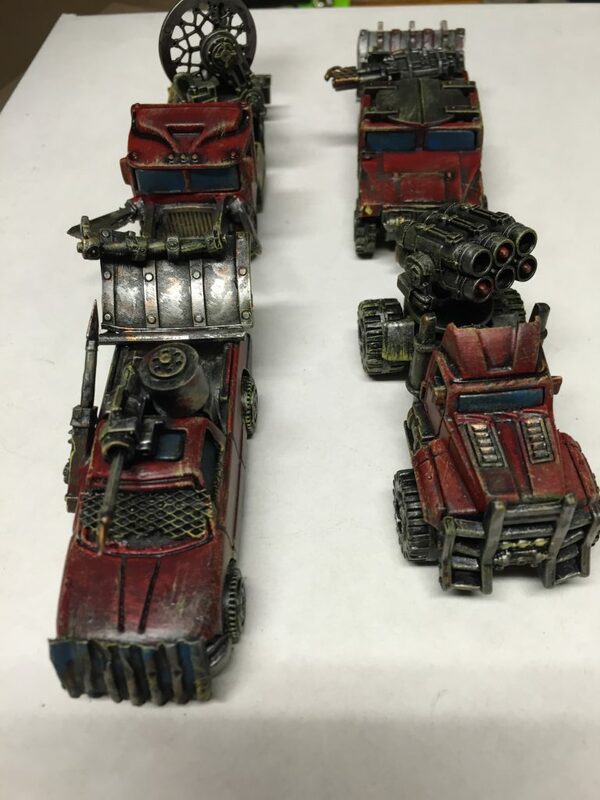 The truck got rocket launchers, while the two pick-up trucks had “ploughs” attached to the back. 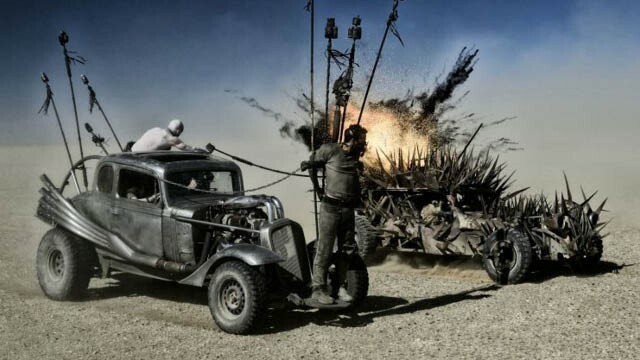 In Fury Road these devices were used to slow the vehicle down after they harpooned another car – so of course I gave one of my trucks a harpoon! 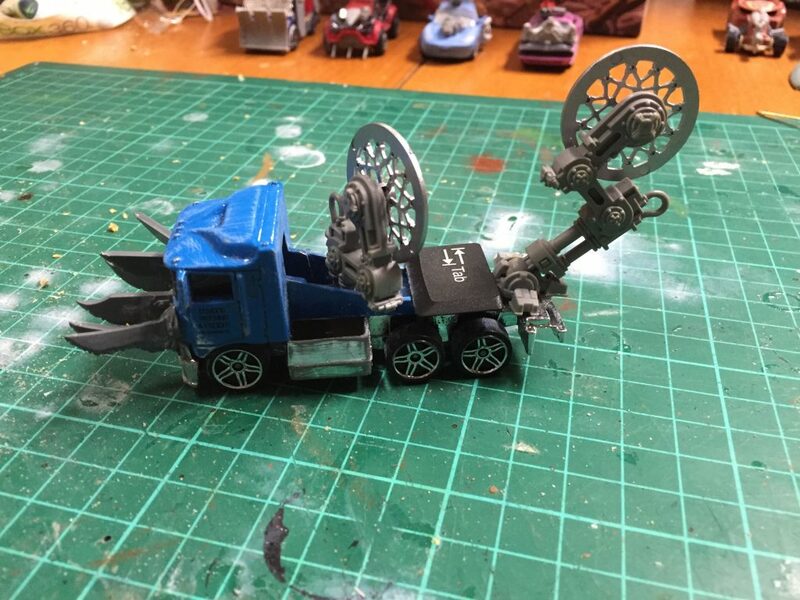 Finally, the big truck got two huge circular saws made from the rims of an old motorcycle toy. I imagine the giant saws were salvaged from some kind of enormous tree-lopping machine and repurposed for car destruction. So there you have it. 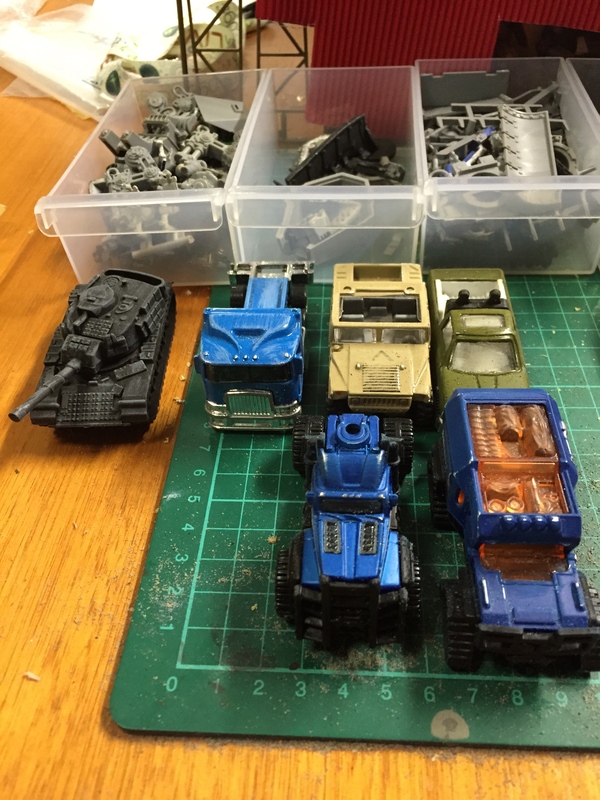 How I put together my wasteland convoys. 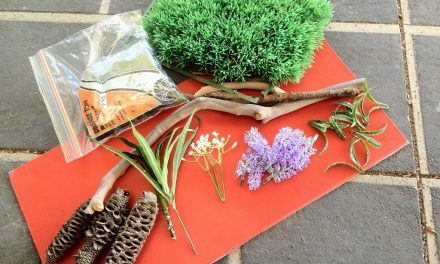 I hope this answered some of the questions you had!